Do you have special ways to help you remember to pray for others? Recently I received some special Christmas Gifts. Each one of these are very nice gifts, but also can be used to teach or to remind me of something. 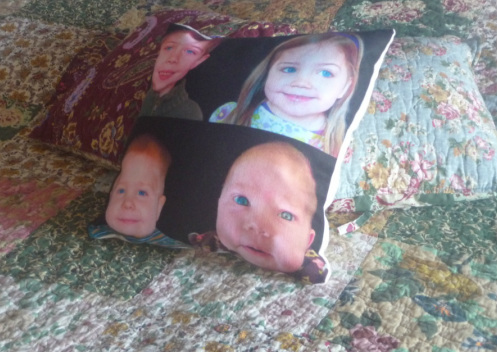 One of the gifts I received is a photo pillow of four of my grand children. I just love it! It lays on my bed and every time I see it, I am reminded to pray for each one of them. Praying for their Salvation is of course very important, and there are many other things that I pray for too. Here is a good list to go by when praying for your children and grand children and a free printable bookmark to go with it. I look forward to the day when everyone of my grandchildren are saved; I look forward to spending all eternity with them!